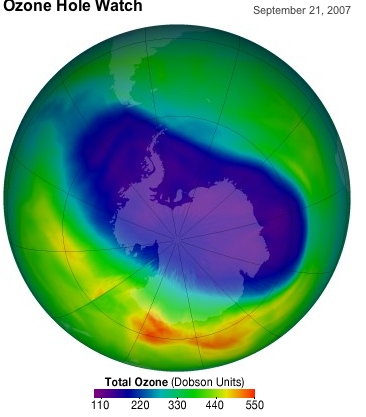 MONTREAL, Sep 23’07 (IPS) – More than 190 nations agreed this week to combat global warming and accelerate the healing of the ozone layer, although critics say more could have been accomplished. The sun shone bright and warm here on Friday, the final day of the 19th Meeting of the Parties to the Montreal Protocol to protect the ozone layer. Outside, caravans of pre-school children in strollers or holding hands as they walked sported hats and long-sleeved shirts to protect their delicate skin. It can be easy to forget that the sun was not always so dangerous, and that modern society is responsible for putting chemicals into the atmosphere that continue to destroy the ozone layer that protects all life from harmful levels of solar ultraviolet radiation. And we forget that things could have been far worse without international action in the form of the Montreal Protocol, which opened for signature 20 years ago this week. Sadly, that action came late and was not vigorous enough for millions of people who have or will get skin cancer. Today, more than one million new cases of skin cancer are diagnosed each year and more than 10,000 people will die as a result in the United States alone. That’s nearly 90 percent more skin cancer than in the 1960s. Medical costs for treatment for non-fatal form of skin cancer in the U.S. is more than a half billion dollars a year. A 2002 British study by the Imperial College of London looked at both medical and other costs, such as loss of productivity, for both forms of skin cancer and determined the total annual cost was nearly 300 million dollars. Britain has “only” 70,000 cases, with 2,000 in the fatal melanoma form. And then there are the incalculable costs to individuals and their families. Skin cancer rates will continue to climb because the ozone layer will remain crippled for decades by past and current emissions of chlorofluorocarbons (CFCs) and halons, chemicals used as refrigerants, aerosol propellents, solvents, foam blowing agents and as fire extinguishers. In fact, because skin cancer takes many years to manifest, excess skins cancers will triple from present rates by 2040, according to statistics from Environment Canada. In Australia, most of the U.S. southwest and northern Mexico, and over large parts of Argentina, Chile, Paraguay, Bolivia and Uruguay, skin cancers will soar even higher by 2060, reports the Dutch National Institute for Public Health. Without further action by the 191 member nations of the Montreal Protocol on Substances that Deplete the Ozone Layer, skin cancer rates will not return to normal until well into the next century. “Sri Lanka will phase out CFCs by 2008, two years ahead of our obligation under the Protocol,” said the head of the Sri Lanka delegation at the 19th Meeting of the Parties (MOP19) in Montreal. A very informative article! I think that Skin Cancer litigation is going to be the next “Mesothelioma” (asbestos caused cancer) that we see in the courts. North American businesses better get a plan going to protect thier workers ie UV clothing, sunscreen, sunglasses etc, to halt the spread of this preventable disease, because the ozone problem will not go away! I’m currently runnining a health and Wellness awareness group under the social work proffesion. There is no connection between global warming and skin cancer that I know of. I was writing about the depletion of the ozone layer and the fact that chemicals that hurt ozone are also global warming gases. It’s nice to know that you guys are helping educate the world about cancer. Thanks for the post.